George Walford died in late August 1994, an event not much noticed in the [Antiquarian Bookselling] trade. We stood in silent memory of him, as is our custom with ABA members, at the ABA Committee, but there was little talk of him then or afterwards. Some surprising people said they had never met him. Somewhat to my surprise, when I started enquiries with a view to writing an obituary of him, I discovered that I knew him almost as well as anyone – and this of a prominent bookseller who, to me at any rate, had always seemed something of a legend in his field. When I circulated a number of old hands seeking reminiscences of him, the haul was minimal. Harold Halewood last saw him some 20 years ago at a sale north of Carlisle, where there were plate books and George, “keen as ever,” bought his fair share of them. Like others, the main memory is of his weekly lists in Clique in competition with Jack Joseph. Tony Doncaster was much the same: “he was a very discerning and knowledgeable bookseller and one had great respect for him.” Tony remembers an underbidder once asking George why he had bid so much on a certain lot? “Because you were bidding and I thought there must be something good in it,” answered George. “And I thought the same about you” said the other bidder. As Bernard Simpson says, “I knew him of course. Although a reserved person, I liked him and we got on well. He was a very courageous buyer and a fine bookseller of many years standing and should have something written about him.” Graham Scott was a customer but doubts if he exchanged a dozen words with George himself! The first thing to understand about George Walford is who he was not! He was no relation to the Edward Walford whose nineteenth century bibliographical works most of us know. He was also unconnected with the Walford Brothers who bid at Sotheby’s in the 1890s and whose business was finally run by someone known as Fatty Warne in Southampton Row in the 1930s. Not that we knew. I always thought Walford’s in Upper Street was the successor business. Eric Morten sent me a fax recently headed “George Walford, formerly Walford Bros” and I suspect we were not the only ones. Curiously enough, however, his family was surprised at this line of questioning. He had himself never mentioned that his surname was one to conjure with in this business. Eric, whose records of dealings with “Walford’s” go back to the 30s, says that “George knew his books, the prices and his market and of that there is no doubt,” but, like almost everyone else, he does not claim to have know George well. David Ferrow got on with him well but found him a private man, almost an enigma. Private is the word. John Sperr knew he lived in Highgate nearby but never met him, although George had runners who visited Fisher and Sperr. Martin Hamlyn lived in the next street for years but never got more than a slight smile from him. George Walford was the son of a builder in Hackney, of a vaguely Huguenot family. Born in 1919, he failed to settle to anything in his younger pre-war years until he found a job as a bookseller’s assistant to David Low immediately after the war. He stayed with Low for two years in Cecil Court. During this period he met and was much influenced by Harold Walsby, a theoretical philosopher in what became known as systematic ideology. I have not been able to find out quite what George did during the war, but it seems to have been on what was called the home front. Soon after leaving Low, he started work from an old and very general bookshop in Upper Street, which had the benefit of large premises (the previous owner wishing to depart to become a Buddhist). 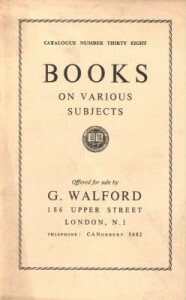 In 1948 he bought the business, rechristened it George Walford and embarked on the serious antiquarian bookselling for which he eventually became known. At first, surprising as it may seem to those who knew the business later, he dealt in everything and ran a small lending library from the premises. He even sold new books. He married in 1949 and eventually had two daughters. His widow tells me she remembers the purchase of a large library coinciding with their marriage. Although she assisted in the business for some years and one of his daughters married a bookseller, the business revolved essentially around George. He had assistants and packers but they remained subordinate, at least until he took Nicholas Goodyer into the business. By the early 1950s Walford’s was moving up market. He began cataloguing very conventionally, having Frank Jukes print a long series of traditional catalogues in what I would term the old “Thomas Thor” style, double column small type. I have Catalogue 18, which was labeled “Postal Business Only” and was put out from Primrose Gardens, NW3 covering Social History, Medicine, Science, Heraldry, Topography, etc. By no. 37 the catalogue came from Upper Street, had a cover and ran to 400 items. This conventional approach seems to have changed in the late 1950s. He gradually closed down the general bookselling, blocked off the front of the shop so as to exclude customers from the back and became an aggressive buyer at auctions and around the country, putting out lists rather than catalogues, often weekly. His lists became famous for their cheap production (printed on a Gestetner and stapled) and he embarked on the major trade advertising which made his name in the trade. Bernard Simpson thinks he may have been the first to buy books for breaking. He was certainly among the first to recognise that particular market and he embarked on a price war with two or three other dealers which led, eventually, to a ban on actual bidding through the pages of Clique, a policy continued by Bookdealer. Although he knew the destination of many of the plate books he sold, he disliked seeing a book physically broken and would not allow it in his shop. But there was in fact a very good reason why George did not mix much with the trade socially. He had two other sides to him which vied for importance in his life with bookselling. His early friendship with Harold Walsby had developed into an association with a group of other thinkers interested in analytical philosophy. As John Rowan says in the only other obituary I have seen of him, George had an acute dialectical intelligence and the way he could see the contradictions in what anyone said [was] very fast.” After Harold died, George became a leader in this field, organising discussion groups and lecturing at Conway Hall. I remember George calling on me occasionally in North Bucks in the early 1970s, driving a large camper which he would park in the drive and stay in overnight. By the following morning he would have collated all his purchases and perhaps accept a hot drink before driving off to his next call. He ranged widely, mainly north of London, attending auctions and calling regularly at larger bookshops. I never heard of him in Hay and Frank Westwood never saw him in Petersfield. Like all of us, I expect he had his favourite routes. A reason why he did not range quite as widely as he might would have been his sporting activities, the third side of his life. 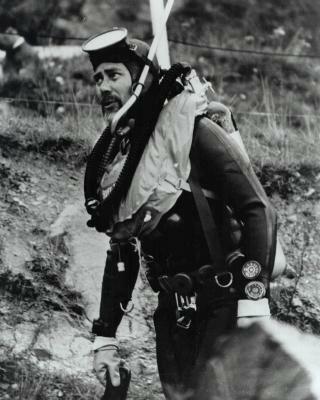 One of the two illustrations I have included with this article shows him in diving gear but that was by no means everything he did. He owned a yacht called Gandalf the White in which he would range as far afield as the Azores. He flew, sailed, surfboarded, took up skiing briefly and broke his arm hang-gliding. I know of nobody in the trade who knew anything of all of this, save for Chris Kohler, who bumped into him once on a skiing holiday. He had latterly to slow down after a mild heart attack, but he maintained his interest in individual sports to the day he died. He last few years saw a gradual winding down of his interests, perhaps not as smoothly conducted as he would have wished. Nicholas Goodyer, who had worked with him for some years and was at one time married to Sharon, his elder daughter, took over the business, which he now runs as Walford’s (Nicholas Goodyer). The changeover was not amicable in its final stage and Nick has not felt that he could help me with this memoir, a reticence I respect. The business now occupies premises in Calabria Road, Highbury Fields. 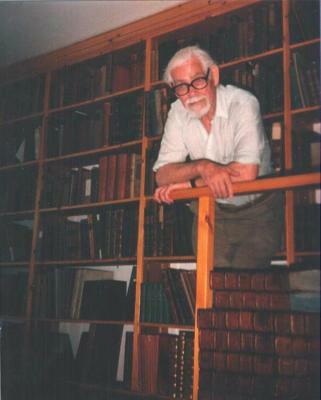 George started withdrawing from active bookselling in the early 1980s. He devoted more time to his magazine and to writing his two books. As he got to grips with a modem computer, his publications in this field acquired a more professional finish. In March 1994 he announced that his magazine would be appearing less often while he wrote a new “general statement of systematic ideology” which he unfortunately died before completing. The transfer of the business was unduly protracted, but he definitely felt himself a retired bookseller when I had a long talk with him some years ago. Somewhat to my surprise, he had with some deliberation opted to share a seat with me in a coachful of booksellers and we subsequently stuck together at the reception. I found him charming and, as Raymond did, much more forthcoming than he had been ten years before. He seemed to regard the other ABA booksellers on the bus warily, with almost a touch of shyness. I wish I had known as much about him then as I know now, although that is a constant feeling one gets when writing memoirs. George Walford’s approach to trading in books was perhaps rooted in the 30s, a hard time, and he did not mix freely with what is a gregarious trade. Nonetheless, he deserves to be remembered as a talented bookseller with a largely unsuspected breadth to his life. As a confirmed believer in browsing, I found myself looking askance at him on occasions but I am now clear that the man and his thought will be missed both in bookselling and in fields far removed from his business.